01B2 Electric Lifting Counterbalanced Crane is a heavy-duty counterbalanced workshop crane (built-in ballast weights) with a 360° pivoting arm, suitable for handling industrial equipment up to 200 kg in line with Safety international standards. 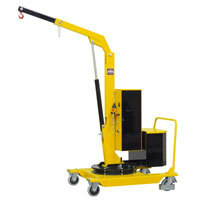 It comes with a pendant control station for electric lifting and lowering of the jib, and an emergency button. The crane is fitted with traction battery and battery charger. Easy to move, thanks to its high capacity pivoting wheels fitted with foot brakes. Jib is extendible in 4 positions. Because of its light- capacity, this model does not require inspections by certified Boards under Directive 2006/42/CE. Optional jib extension is available to increase the crane maximum reach up to 1360 mm (at 71 kg capacity).